One of the largest and most exciting e-sports competitions on the world, The International (or TI) brings pro Dota 2 players from all over the globe to compete in a five-vs-five team battle for the largest cash prize in competitive sports. 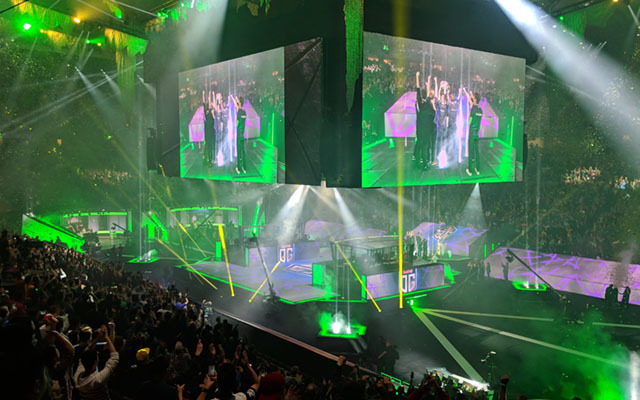 This year, the stage was set at Rogers Arena in Vancouver, BC with a crowd-funded prize pool of over $25 million with over $11 million going to the first place team. RUN Studios partnered with Valve Software to create motion content in the lead up the event and during the week-long tournament. I worked closely with RUN and Valve to create a variety of videos including team profiles, location vignettes, event collateral, and fast turnaround tournament recaps. Gameplay and video content were streamed to 94 foot wide LED screens above the players' stage giving the arena's audience a clear view from any seat in the facility. With multiple broadcast cameras, player cameras, roving cameras, and screen captures recording multiple matches every day, the event had a vast amount of footage that needed to be distilled into a 4-5 minute recap edit each night (a responsibility shared by myself and another editor). Each day the tournament would kick-off with this brief show open. As teams would be eliminated from the competition, the voiceover and some select footage would need to be replaced the night before until the final day of the tournament. The piece contains a mix of footage from previous competitions, newly created elements, and current event footage. In the weeks leading up to the competition, our team made several videos that showcased a behind-the-scenes look at a few of the teams that would travel to Vancouver, BC from around the world. As a free-to-play game, these players come from all walks of life but share a common passion for the game. Here are three I had the opportunity to edit. After the last match of the day during the competition, myself and another editor would begin the overnight process of sorting through the day's player and gameplay footage to create broadcast recaps of tournament highlights and end of day bracket standings. Often these would not only capture the great plays that attract large audiences to Dota 2, but the drama and emotions among players as well. We created one of these video each day of the competition, but here's two examples. A couple more comedic pieces I had the opportunity to help out with.